Aside from being a pesky addition to your outdoor fun, several mosquito species have been linked to carrying West Nile virus, an infection that can cause serious illness. There are 70 different species of mosquitoes in New York State, so how can we best avoid and reduce our exposure to mosquitoes? 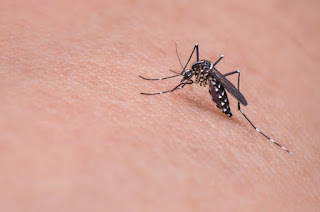 Some mosquitos are most active between dusk and dawn when the air is calm, and that is when the females are most likely to bite. However, others will feed at any time of the day. Some mosquitos lay their eggs in standing water around the home. They can develop in any standing water that remains more than four days. Weeds, tall grass and shrubbery provide an outdoor home for adult mosquitoes, which may also enter houses through unscreened windows and doors, or broken screens. Many kinds of mosquitoes will breed in discarded tires. How can you reduce the number of mosquitos around your home?